We’re always planning great events throughout the year. You won’t want to miss out on the next big event so keep checking back for the latest event information. There’s always something going on at your neighbourhood 7-Eleven! We’re constantly finding new ways to celebrate, so download 7Rewards and never miss out on another event. What’s cool about November 7th? It’s 7-Eleven in reverse! What’s even cooler is that if you visit our stores on November 7th AND wear your clothes backwards you get a FREE Medium Slurpee. Have fun, dress in reverse and enjoy a refreshing Slurpee on us! YOU TRICK: on Hallowe’en, October 31, come into our store dressed up in your spookiest, scariest, funnest Hallowe’en costume. WE TREAT: score a small Slurpee or small hot chocolate, any flavour, absolutely FREE. So gear up and spook us out. Your free Slurpee is waiting. One little thing. We want to see all those creepy, weirdy faces, so no masks, please. This Thanksgiving week, we’d like to say thanks… to you. Thanks for your business, your support, your loyalty. So as a token of appreciation for your patronage, we’re offering you, free, on us, a small-size cup of our savoury Pumpkin Spice Latte, or any small hot beverage. We value your visits all year long, and Thanksgiving seems like the perfect day to present you a little reward. And a delightful little reward it is – our Pumpkin Spice Latte is a warm, tangy, delicious treat we know you’ll love. Come in this Thanksgiving for your complimentary cup. While supplies last! Sept. 14th, 2018 is Slurpee Name Your Price Day. You decide what you will pay for a large Slurpee. Your donations will go to WE Charity – giving Canadian youth the tools they need to do good in their community. Minimum 50c donation. Seems just about everything has a ‘day’, these days. Nerd Day. Submarine Day. Frog Jumping Day (ribbit). So we decided to get in on the act with Wedge Day. Friday, August 10th. August 10th is also Lazy Day, incidentally; seems there just aren’t enough days to go around. Anyhoo―on Wedge Day, spend at least $2 on any hot food item and we’ll throw in 3 of our delicious potato wedges, free. OK, we won’t literally ‘throw’ them in; we’ll include them. Don’t want to start a food fight. So forget about Lazy Day and come join us for three free wedges on Wedge Day, August 10th. If your weekends somehow seem to fly by, here’s one weekend with a reason to. National Wing Weekend, July 28th and 29th. Forget those other summer weekend foods, on National Wing Weekend, wings are king. Especially at this high-flyin’ price: 10 wings for $7.11. Our wings are so good you won’t believe it, made fresh in store, always hot and juicy, 24/7. So if you’re looking for an excuse to go a little wingy on the July 28th-29th weekend, here it is. National Wing Weekend. The weekend for wingnuts. You know who you are. We call July 11th 7-Eleven Day because it is 7-Eleven. 7th month, 11th day: 7-Eleven Day. We celebrate it as our birthday, and it’s a birthday with a difference: it’s our birthday, but you get the gift. What gift? Free small Slurpee, anytime between 11am and 7pm. (There’s those numbers again). There are thousands, tens of thousands, maybe millions of Slurpee lovers across Canada, and 7-Eleven Day is our chance to reward them with the one gift they’ll appreciate more than any other, the one gift that only 7-Eleven can give. Not a tie; not an iron―Slurpee. Come party with us. 7-Eleven Day. July 11th. To remember the date, remember our name. Shouldn’t be too tough. We live in the best country in the world. By every standard, Canada ranks at the top of the charts. To be Canadian and to live in Canada is a joy and a privilege almost beyond measure. Where else can you enjoy personal freedom, endless opportunity, and, oh yes, free Slurpee? That’s right, free Slurpee. On Canada Day, buy one Slurpee and get a second Slurpee free. Just visit your local 7-Eleven proudly wearing a symbol of your Canadian pride. Come on Canada, rock your red and white. Get out the gel, the mousse, the temp dyes. It’s Crazy Hair Day again on Friday, June 22. It’s the one day of the year that total follicle anarchy will earn you a free medium Slurpee. The rules are simple: there are no rules. Free you hair from all standards of accepted civilized behaviour, then wear it into your 7-Eleven. Boom―a free medium Slurpee. Embrace coiffurial chaos and score free Slurpee. Say, is there a muskrat living on your head…? 2 Days. 2 Much Fun. Here’s what you do. Go to you junk drawer, or your ‘crap closet’, or to any shelf, cabinet or cubby that hasn’t received human scrutiny in ages. Search for the weirdest, goofiest or most useless old container you can find: an old trophy, a chamber pot, a superannuated kettle, whatever. Wash it out. And on Friday or Saturday, May 18th or 19th, bring with you to 7-Eleven. ‘Cause for just two bucks, you can fill it to the brim with your favourite Slurpee. It’s Slurpee Bring Your Own Cup day, May 18th and 19th. 7Rewards Members can enjoy one FREE small 12oz coffee or hot beverage every day from April 23rd to 28th. Take this opportunity to try our delicious new Hazelnut Hot Chocolate. Do you love coffee? Have a free Blonde Roast. It’s our new light and flavourful cup of coffee with gentle echoes of nuts and caramel. On Sunday, April 22nd, 2018, 7Rewards Members can enjoy a FREE Coffee or Hot Beverage refill up to 36oz or less. Slurpee® lovers love sports. Especially hockey! On Saturday April 7th, 2018, 11:00am – 7:00pm, wear your favourite hockey jersey to your neighbourhood 7-Eleven to get a FREE medium Slurpee®. Download 7Rewards app to get your Free medium Slurpee. Plus double the free and get 1000 bonus points to redeem for another free Slurpee or snack. Grab your favourite mug, visit any 7-Eleven Canada on Nov. 15 7am-7pm and fill up your mug with 100% Arabica Coffee, Hot Chocolate or a flavoured latte for FREE! Try our new Cadbury Caramilk flavoured Hot Chocolate – only available for a limited time. Size matters – Your mug must be watertight and clean. When full, your mug must fit within 26cm diameter. 1 hit wonder – Only 1 mug filled per person, per day. What’s cool about November 7th? It’s 7-Eleven in reverse! What’s even cooler is that if you visit our stores on November 7th AND wear your clothes backwards you get a FREE Medium Slurpee. Plus check out @SLURPEECANADA and @7ELEVENCANADA on Social for your chance to win $117 Slurpee gift card – go to Slurpee.ca to learn more! We want to see your costumes this year! Dress up for a FREE small Slurpee. Come into any 7-Eleven in costume (no masks please) on October 31, 2017 and get a FREE Small Slurpee. Bring Your Own Mug – visit any 7-Eleven Canada on Sept. 29 7am-7pm and fill up your mug with 100% Arabica Coffee or Hot Chocolate for FREE! Sept. 15th, 2017 was Slurpee Name Your Price Day. You decided what you would pay for a large Slurpee. 100% of your donations went to the WE Charity – giving Canadian youth the tools they need to do good in their community. What’s sweeter than Slurpee? The fact that you, Slurpee fans, donated $90,016.26 for the WE Charity on Slurpee Name Your Own Price Day. A huge thank you to everyone who came out and donated to empower Canadian youth by giving them the tools they need to to do good in our world! As a sponsor of WE Day events in Canada, 7-Eleven is giving Canadian youth the chance to attend this powerful, life-changing event. Learn more about WE day now. WE is a movement that brings people together and gives them the tools to change the world. Your donation on Name Your Price Day sends Canadian you to WE Day – an inspiring event that celebrates youth making a difference locally and globally. Crazy-Colour-Do your hair for a FREE Slurpee – June 16th. Post your pics with #SlurpeeCrazyHairDay on Instagram, Facebook, and Twitter! Get your favourite flavour combinations and bring your most creative cup to the store on this day for a chance to win a $50 Gift Card. Share your pic with your friends using the hashtag #BYOCCanada and @SlurpeeCanada in your post on Instagram, Facebook or Twitter. 7-Eleven in reverse is 11/7 or November 7th. It is also the date of reverse 7-Eleven Day, which is also FREE Slurpee day – if you come in to 7-Eleven with your clothes on backwards. Get a FREE Medium Slurpee when you show up in REVERSE! Scan your 7Rewards app to earn 2 Bonus Stars! On September 23, 2016, 7-Eleven Slurpee fans donated over $61,970 to Food Banks Canada in support of their local food banks. The Slurpee Name Your Price campaign has generated over 875,900 meals to make a difference for Canadians in need. Every $1 dollar raised for food banks creates 3 meals with over 36% of those helped being children & youth. Thank you Slurpee fans for working with us to make an impact for on our communities! We’re celebrating 50 Summers of Slurpee. This July 11th we’re serving customers over 3/4 million free Slurpee drinks at the World’s Coolest Birthday. Stop by any 7-Eleven store from B.C. to Ontario to enjoy a FREE 12oz Slurpee drink between 11:00am and 7:00pm on Monday, July 11, or while supply lasts. 7-Eleven will present the City of Winnipeg with the Slurpee Cup at its Birthday party at 37876 Portage Avenue, and Slurpee lovers are invited to join in the fun. The world’s largest Slurpee (711 litres) will be proudly on display, Mr. Slurpee will be in attendance, as well as live music, face painting, games and more. Stop by our new from 11AM to 2PM to join in our Slurpee Capital of the World Celebration. We threw down the challenge to all Slurpee fans to pull out all the stops for BYOC. Five Slurpee fans were rewarded for their creativity with bringing the most creative cup on March 18th. All they had to do win a $100 gift card was to post a picture on Instagram, Twitter, or Facebook and tag it with #BYOC. Winners were announced by Crawford Collins, rising Canadian online entertainer. Vancouver local, the star of The Bachelorette’s eleventh season, Kaitlyn Bristowe, joined in the Coffee Date cup fun on Valentine’s Day, 2016. In the spirit of the Bachelorette, Kaitlyn and fiancé Shawn Booth played matchmakers from 1pm -3pm by embodying the role of coffee baristas and pouring coffee into the appropriate Coffee Date cups for coffee enthusiasts at the Homer and Helmcken 7-Eleven store in Vancouver. It’s Eleven-7 Day at 7-Eleven and we’re having a Slurpee® Beach Party! What better way to turn winter on its head than by getting your beach on? Show up to your local 7-Eleven in your beach duds and get a free, medium Slurpee® of your choice. So come in between 11am-7pm on Saturday, November 7 (11/7) to get your free Slurpee®! Name your price for a large Slurpee and 7-Eleven will donate 100% of whatever you pay to Food Banks Canada supporting local food banks. Every dollar raised equals 3 meals for people in need. Last year we donated over $120K to provide over 360,000 meals for Canadians. So let’s do even better this year. 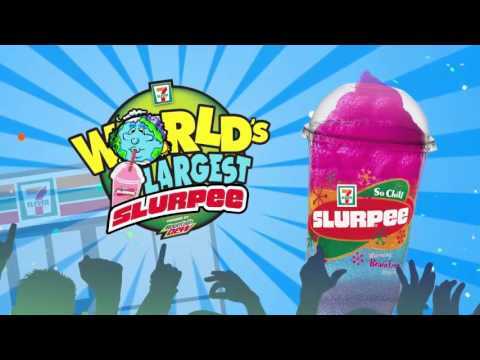 We’re declaring a World Record: World’s Largest Slurpee! Join us in the Slurpee Capital of the World as we unveil a huge surprise that you can only see in Canada – the world’s largest Slurpee! At a whopping 711 litres (naturally), Winnipeg will play host to this gigantic event on July 11th – our birthday! Come down and join us for Birthday cake, Live Music, Magic, Balloon Animals, and the presentation of the Slurpee Capital Trophy. From February 12 to February 14, 7-Eleven Canada will be serving its fresh premium 100 per cent Arabica coffee in limited edition, customized coffee cups that will reveal whether the guest is Single, Taken or It’s Complicated.